As the summer months begin and the temperature continues to rise, I thought it might be reasonable to review heat emergencies. Heat stroke, heat exhaustion and other environmental emergencies become more prominent in the summer months and those working in the ER, urgent care should have a good grasp of diagnosis and management of these conditions. Unfortunately, heat emergencies such as heat stroke account for between 400 to 600 deaths per year (Tran, 2013). Many of these deaths are entirely preventable and primary care providers should spend some time during well child checks and physicals addressing how to manage heat exposure with patients. It should not be assumed that patients are aware of the importance of hydration during the summer months or in general. Heat stroke is the most dangerous outcome related to environmental heat exposure. Children and the elderly are most susceptible. As we review our physiology, we will recall that our body’s thermoregulatory setting is at 37 C. In hot environments, the body must rid itself of excess heat, usually through evaporation. The internal mechanism is to use acute phase reactants and heat shock proteins to help regulate temperature. Cardiac output will be adjusted to provide more blood flow to the peripheral circulation which results in increased diaphoresis (Tran, 2013). Cytokines and proteins help to repair tissue and prevent protein denaturation. When heat stroke occurs, the above mechanism is broken down and endothelial injury, coagulation disturbances, and a loss of thermoregulation occur, resulting in significant end organ damage. Risk factors for heat stroke and other heat emergencies include poor physical conditioning, new environment, obesity, water depletion, alcohol use, heavy clothing, lack of free water, higher humidity. Other long term health risks including uncontrolled diabetes, hypertension, and heart disease can influence (Frank and Fields 2016). As discussed above, general prevention is very important. Patients should be educated about fluid replacement and hydration status. Patients traveling to new areas or vacationing should allow a few days to acclimate to the new temperature. Dressing with light, moisture wicking clothing is helpful. For patients insisting on working or exercising in hot weather, extra care must be attended to hydration status. Patients doing moderate exercise in heat should drink at least 8 oz of water or electrolyte drinks for every 15 to 30 minutes of activity. Those working outside should be encouraged to stay hydrated and take frequent breaks, going inside if possible. Work should be avoided in the hottest parts of the day, which is usually early to mid-afternoon. In patients who develop heat emergencies, presentation may include a constellation of symptoms. In mild heat stroke, patients may complain of fatigue, malaise, weakness, dizziness, nausea, vomiting, myalgia and headache in the setting of recent exposure. Agitation, incoordination, confusion, hyperventilation, thirst, and paresthesia are common. On physical exam, patients are hyperthermic. Core temperature should be measured and monitored serially with a rectal or bladder probe. Exertional heat stroke can have a rectal temperature of > 105 F. Tachycardia is common, hypotension is a later sign. Patients may be obtunded or present in coma. Neurologic exam should be carefully performed. Mucous membranes are usually dry, skin may appear hot and flushed. Respiration is usually tachypneic and heart rate is tachycardic. It is important to note that lack of sweating is a late sign of heat stroke and should be taken very seriously. The work up in terms of lab work in this condition is to screen for end organ damage. Electrolyte testing can look for hyperkalemia or other electrolyte derangement. A liver function panel assesses for liver damage. A creatinine kinase can check for rhabdomyolysis. A blood gas may show respiratory alkalosis. 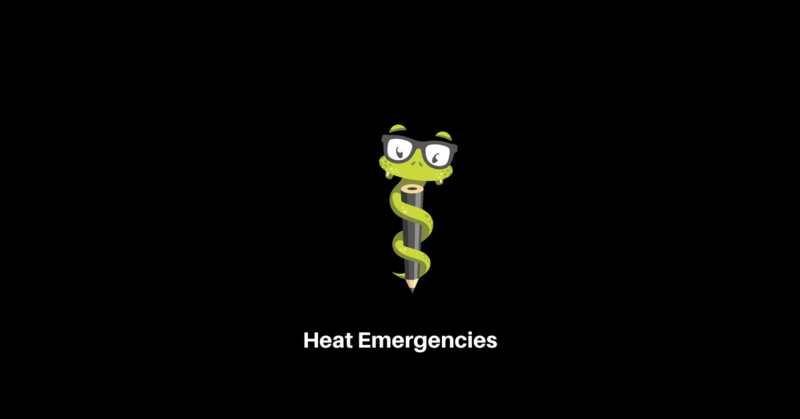 Treatment of heat stroke is emergent. Airway, breathing, circulation must be assessed immediately. Patients who are obtunded may need intubation. The main goal is to reduce core temperature as rapidly as possible, prior to end organ damage. This is accomplished via stripping patient of clothing, placing ice packs on neck, groin, axillae. Ice water or fans are helpful as well. Patients should receive supplemental oxygen. Serial core temperature monitoring is vital. Fluid resuscitation with IV normal saline or Lactated Ringer’s should be used in volume depleted patients. Volume overload should be avoided, but fluid balance is essential. Other more dire methods to reduce temperature include cold IV fluids, urinary or gastric lavage, cooling blankets, cardiopulmonary bypass. The treatment for rhabdomyolysis is hydration. Electrolyte imbalances should be corrected as well and patients with true heat stroke should be monitored in an intensive care setting. Mortality can vary, but is dependent on the length of exposure and time to first treatment. Heat exhaustion is a lesser form of heat exposure and is usually accompanied by dizziness, nausea, vomiting, fatigue. There may be tachycardia, or orthostatic hypotension. Core body temperature usually does not exceed 104 F. Neurologic exam is usually normal and lab work may show dehydration. The treatment is rest, removal from the exposure, fluids. The goal is to avoid the development of heat stroke. Heat cramps are painful muscle spasms as a result of dehydration and may occur in athletes. Core body temperature is usually normal. IV fluids and electrolyte replacement is the key of treatment. Heat edema is common in patients presenting to new climates and is a result of vasodilation. Patients present with swelling of the dependent extremities which usually resolves with compression stockings. Other causes of peripheral edema should be ruled out. In summary, heat emergencies are important causes of morbidity and mortality in the elderly, athletes, and those whose occupation requires them to be outdoors. Patient education is the key to prevention. Heat stroke is a medical emergency and prompt treatment proves a reduction in mortality.